The E.M.S. Gallerie is proud to present the artwork of Chrissy McGirr. She has had an extensive career in E.M.S. and Pre-Hospital care that spanned more than one and a half decades. She worked in the downtown district, at Fire Station one, for most of her career. Prior to E.M.S. she was a photo journalist. Now, retired from E.M.S., she is missed for her quick wit and spontaneous candor. Even though she is no longer working in the field and helping peolpe, she still has a lust for fire engines, ambulances and emergency services. Chrissy can be found ridding on Engine 4 in the heart of the city on any given night armed with her cameras. She currently resides in a loft in the trendy Gas Lamp District of San Diego. She has in the past created her images from original photographs that she then used to as models and templates to paint with oils on canvas. At present, her work consists mostly of images recorded on a Kodak DC120 digital camera, and artistically altered ..... on her Power Mac using a variety of programs including Photoshop, Painter, and Pagemaker. She then prints the images on either canvas or paper on a Hewlett Packard Design Jet wide format printer, and finishes the process by brush. Some of her work was on display at Lindbergh Field..... for AirEx 94, and also at City Hall in 1995 and 1996. 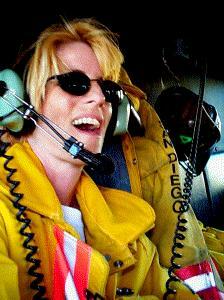 Her work can be seen today in a variety of locations including several City of San Diego Fire Stations and City Offices. She has an extensive collection of "City Scapes" as she call it. A book of her artwork will be published in late 2000. E-Mail Chrissy McGirr for more info on her work and for details on how to obtain these images for commercial use or for your collection.